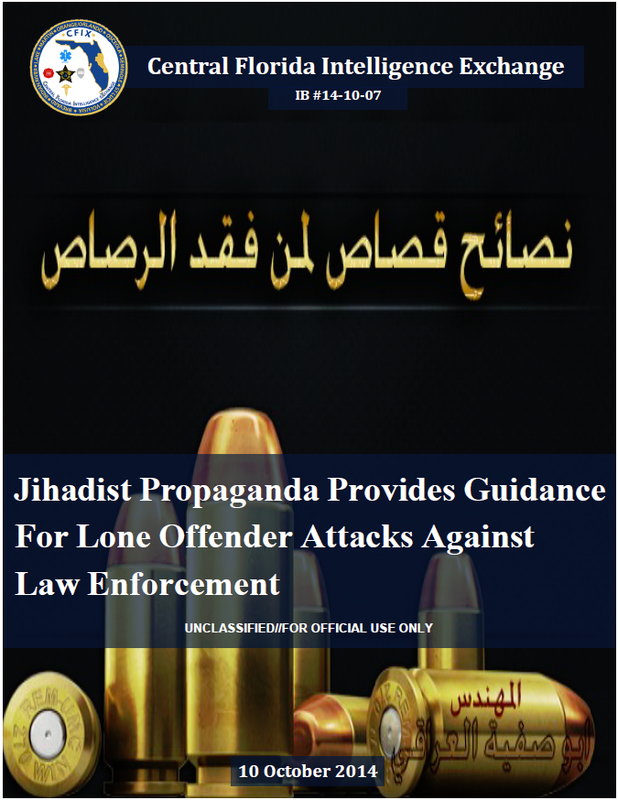 The following bulletin provides valuable translations of Islamic State propaganda distributed on Twitter providing guidance to potential lone offender jihadists seeking to conduct attacks against law enforcement. The document was obtained from a public web forum where it was being disseminated by employees of a private security company. (U//FOUO) Propaganda providing guidance and/or encouraging “individual jihad” or small cell operations against the West continues to be a prevalent theme in jihadist messaging. This bulletin was created by the CFIX in order to address recent propaganda from the Islamic State and its supporters which provides guidance on targeting law enforcement officers. The CFIX bases its analysis in this bulletin from open source reporting and internet postings with varying degrees of reliability, especially in regards to the true intention and capabilities of terrorist organizations and their supporters. This information is intended to support local, state and federal government agencies along with other entities in developing / prioritizing protective and support measures relating to an existing or emerging threat to homeland security. (U//FOUO) We assess with medium confidence that there will be a continued call – by the Islamic State and their supporters – for lone offender attacks against Western security forces (both military and law enforcement). These threats will likely increase as the U.S. and its allies continue to carry out airstrikes against the Islamic State in Syria and Iraq. (U//FOUO) The CFIX assesses with medium confidence based on historical trends and recent guidance provided in jihadist propaganda, that law enforcement officers could be targeted by HVEs inspired by the Islamic State, Al-Qa’ida and their supporters. Attacks carried out by a lone offender or a small cell of individuals remains the greatest threat. (U//FOUO) We assess that law enforcement officers would most likely be targeted individually in spontaneous ‘ambush’ style attacks similar to the 2013 machete attack against a British soldier in the U.K. Although the victim in the machete attack was a Solider, this type of spontaneous attack has also been encouraged against law enforcement and government officials. (U//FOUO) Adnani’s video message is the first official statement from the Islamic State advocating for lone-wolf attacks; however, supporters and Western fighters from the group began suggesting this tactic in April 2014. As a result of Adnani’s statement, there have been numerous posts, in English and Arabic, on jihadist forums and social media platforms by Islamic State supporters which provide targeting guidance for Muslims in the West. (U//FOUO) In response to Abu Muhammad al-Adnani’s statement, Abu Safiya al-Iraqi, a jihadist who identifies himself as an “engineer” for the Islamic State, wrote an Arabic-language article titled “Retaliation Advice for Those Who are Missing Bullets”. The article was posted to Abu Safiya’s Twitter account on 22 September 2014 and provides instructions for making explosive devices and specific recommendations for targeting law enforcement officials. He states: “We will present a collection of advice for those who are lacking weapons but are determined on revenge against officers and military of the nonbelievers…make the world of the police a hell they live every moment, thinking they will be killed. Do not let them feel secure even in their home”. − (U//FOUO) After identifying the home address of the police officer, the first suggestion provided is to stab him as he enters or leaves his home. After killing the officer, Abu Safiya suggests beheading him as a warning. The second solution is to burn the officer’s house or vehicle. − (U//FOUO) Monitor the officer’s activities and identify his shift change. Watch for the officer to leave in civilian clothing, get him alone on the street or a deserted location and kill him. − (U//FOUO) If you know of a detective but cannot kill him yourself “spread his photo until he’s killed by someone else and do not allow him to ever stay comfortable”. − (U//FOUO) Abu Safiya mentions that “placing suspicious objects in the streets might stop traffic for hours”. He also mentions that police officers can be targeted by providing “false news” to “lure them to a remote area” where the brothers can “finish them off”. − (U//FOUO) If a brother knows that he is being surveilled by law enforcement, he should evacuate his family then “lure the officer into your home” and blow it up. − (U//FOUO) Terrorize the officers by calling them from an anonymous number in the middle of the night and telling them “ISIS is coming for you now and your head will fly off”. − (U//FOUO) He suggests that they remove the tag from their vehicles, cover their face, then search for the officers and run them over. − (U//FOUO) Drive an explosive laden toy car under their police vehicle. Once the officer enters the vehicle, remotely detonate the explosives. − (U//FOUO) For those who no longer have the ability to travel, Abu Safiya advises that they can kidnap and murder military personnel of Western and allied countries. (U//FOUO) Abu Safiya ends his post by advising prospective lone-wolves to allow large scale attacks to speak for themselves; however, smaller attacks should be filmed or photographed and distributed via social media.